In the 21st Century, the field of neuroscience is drawing the best and brightest from computer science, medicine, engineering, psychology, biology, genetics and ethics to study the human brain. Featuring in-depth interviews and demonstrations with neuroscientists from the country's top institutions, including MIT, Harvard, Johns Hopkins, and Washington University, this incredible five part series, Neuroscience: Understanding the Brain, investigates the last and greatest frontier challenging humanity's understanding of our world - the human brain. Program 1: Brain Basics examines the breakthrough discoveries that formed the foundation of modern neuroscience, covering many incredible areas in this revolutionary field, including neural networks, the nervous system, and the neuron. 00:01:07An overview of the series and the human brain is the focus of chapter one. 00:04:56Chapter two deals with 16th Century Belgian scientist Andreas Vesalius, whose dissections of the brain revealed its white and gray matter, and the stunning findings of 19th and early 20th Century scientists like Santiago Ramon Cajal and Camillo Golgi, whose breakthroughs created the foundation for modern neuroscience's investigation into dendrites, the axon, neurons and neuroplasticity. 00:06:38Chapter three delves into the mystery of the neuron, including the synapse, myelin, neurotransmitters, neurotransmission, GABA, gamma-aminobutyric acid, central nervous system, action potential, terminal and the presynaptic membrane. 00:11:31Chapter four covers the wide ranging field of brain imaging, including electroencephalography, EEG, MRI, and functional magnetic resonance image or fMRI, and how this technology can be used to make sense of the brain's parts as well as helping further cognitive neuroscience's understanding of the brain's default mode network and ERPs - Event-Related Potential studies. Program 2: Mapping the Brain: the revolution in neuroscience, is showing how the brain is wired through its neural networks as well as its primary systems as well as its relationship to the nervous system. 00:08:59Chapter one describes how, in order to unlock the brain's many mysteries, neuroscientists are mapping the brain's different parts, including the cerebrum, cerebellum, midbrain, hypothalamus, thalamus, amygdala and hippocampus. 00:07:49Chapter two investigates the brain's systems - the autonomic nervous system, the peripheral and somatic nervous systems - as well as neurotransmitters, such as acetylcholine and norepinephrine, that are involved with movement, sensory input and control of the body's organs. 00:07:42Myelin, myelination, cortical folds and somatosensory cortex are terms that crop up frequently in the Human Connectome Project, a project that uses MRIs and functional MRI to explore brain structure, function, and connectivity. Program 3: The Developing Brain examines the evolution of the human brain from the earliest sea creatures of the Cambrian Era to the modern world and how neuroscience is making sense of the neuron, neural networks and the nervous system. 00:06:33The evolution of the human nervous system and brain with its graceful bilateralism and incredible neural structures, limbic system, neocortex, cortex and frontal cortex, is shown in chapter one. 00:05:57Investigating the incredible world of gastrulation - the endoderm, mesoderm, ectoderm - chapter two examines the embryonic brain's development of the forebrain, midbrain and hindbrain. 00:11:05Using fMRIs to explore the human brain during fetal development, chapter three shows how the sensory cortex, auditory cortex, medial temporal lobes, synaptic density, neural nets, neuroplasticity and myelination affect adolescent brain development. Program 4: The Thinking and Social Brain discusses neuroscience's breakthrough discoveries in the fields of neural cognition, social cognition, neuropsychology and cognitive neuroscience to demonstrate how the brain, through learning and memory, fashions the modern human. 00:04:47Chapter one examines how the complexity of being human depends upon neuroplasticity and the wiring and connections in the human brain, including the cerebral cortex, brain networks and brain substrates, allowing for cognition, enhanced learning and adaptability. 00:04:45Learning and memory begin with the hippocampus, but as chapter two points out, the neurobiological basis for how neurons, the brain, and memory work is not a simple thing. 00:07:29Chapter three investigates the brain's imagination and inventiveness and how they appear to involve widespread areas of the cerebral cortex and the posterior cingulate cortex in forming the brain's default mode network, creating the personality, the narrative self, the experiential self, and how a problem with any of these critical memory structures can cause a whole litany of memory pathologies, including schizophrenia, Alzheimer's and depression. 00:06:21Chapter four looks at how humans use social cognition and the social brain to interact with others, recognize their intentions and become members of the community, as well as employing the process of using mirror neurons to learn new skills by watching other people. Program 5: The Brain, Computers and Technology delves into a future where neuroscience and science fiction meet in robotics and artificial intelligence and how the brain, the nervous system and computers will interface and use the brain's neurons and neuroplasticity to make super humans out of everyone. 00:06:43Chapter one looks at how neuroscientists can use the brain's neuroplasticity to repair brain damage in the motor cortex and spinal cord injuries. 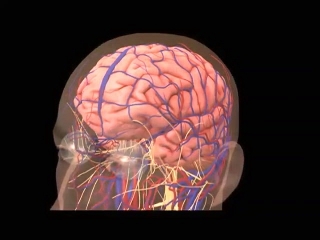 00:06:42Chapter two investigates how fMRIs and EEGs do not give neuroscientists enough information about the brain, however neural engineering with polymer-based hydrogel brain implants or through using nano-particles and magnets, scientists can achieve greater results in research and therapies. 00:09:35Chapter three explores the science and neural ethics behind the new frontier of Brain-Computer Interface, BCI, bringing together advances in modern computers to create cognitive enhancements, including using the brain's intention to move robotic arms and brain-to-brain communication.